Photographed at South Mountains, Phoenix, Maricopa Co., Arizona. Dec. 2008. PERENNIAL: long-lived moss-like plant which quickly recovers to luxuriant green within days of a refreshing desert rain. 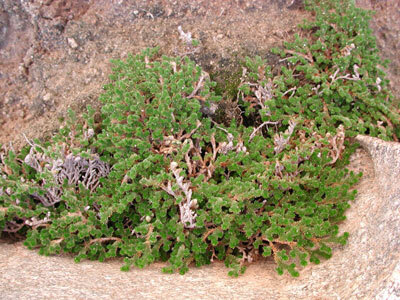 Generally growing from crevices and prostrate on soil or boulders and more likely to be in green, growing condition during the winter-spring months. LEAVES: Leaves are small, triangular, and minutely serrate on the margins. With drought the stems and leaves turn brown and curl tightly into crown of the plant. These resurrect with rainfall. RANGE: In the Sonoran Desert in Arizona and Mexico on shady slopes in the mountains. FLOWERS: None. This plant reproduces by spores released from sporangia.